When my wife suggested Nene Goose, I googled it and realized that I have driven about 10 times in front of Nene Goose Cafe without ever noticing it, I guess I was busy looking over at Lake Kojima and I just didn’t pay any attention. Nene Goose Cafe is located in Tamano on the shore of Lake Kojima right across from the Okayama Konan Airport. The lake was described by my wife as being the filthiest body of water in Okayama, but from the road, it just looks like a big lake and I certainly have no intentions of taking a dip anytime soon, so I guess I’ll take her word for it. I went to Nene Goose Cafe to try their doria (Japanese gratin). I really like Japanese doria which is pretty much rice covered in bechamel and molten cheese. I ordered a shrimp and pesto doria which was quite delicious. The pesto tasted fresh and the combination of shrimps, rice, pesto and cheese is just perfect. My wife got a hamburger doria which was equally good. The dessert at Nene Goose were not too bad, but I have to say the whole experience was ruined by pretty awful automatic machine made coffee. Might be convenient, but I simply hate these machine coffee. 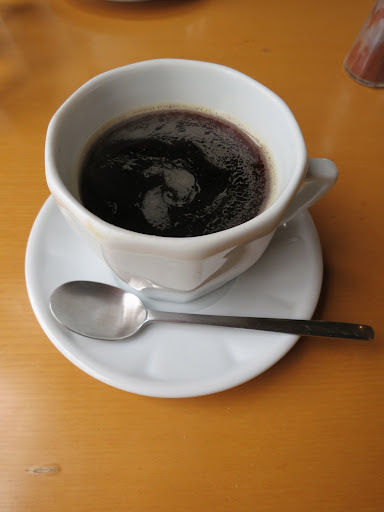 Look at this cup of coffee, it’s a sad cup of coffee. I would certainly not go out of my way to eat at Nene Goose Cafe, but if you in the area, it’s a nice place to stop for a well prepared doria. p.s. There is a really cool bookstore next to Nene Goose called 451.